Discopop Directory: "They dream about being Mumford and Sons"
"They dream about being Mumford and Sons"
Odder than a teapot full of spam balls, here's a 22-minute performance video from Arcade Fire. 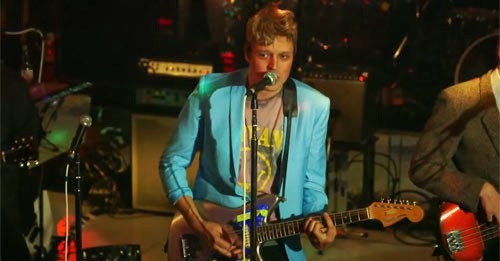 Shot by Roman Coppola in Montreal's tiny Salsatheque venue, it features three new songs as well as a lounge version of Wake Up, for which the band dress up as Duran Duran. No, really. Superbad star Michael Cera cameos as the venue's barman, who'd rather be watching Michael Buble and says Arcade Fire will never be as good as Mumford And Sons. There are further guest spots from James Franco, Ben Stiller, Bono and an irate Zach Galifianakis. "I went to one of your first shows," he shouts at Win Butler in a video link from 'outer space'. "There were more people on stage than there were in the audience. YOU DON'T NEED THREE DRUMMERS." Incidentally, the new songs - Here Comes The Night Time, We Exist and Normal Person - sound fantastic, incorporating new styles (reggae! new wave!) into the band's arsenal of anthemic indie rock.